If you are asked to think of a country which is genuinely invested in the field of engineering, Germany is the country that is very likely to be your answer. Wondering why? Just hear us out: the country spends almost 2.8% of its GDP on research and development, a majority of which is pledged towards engineering, the country is home to some of the finest automobile manufacturing companies in the world, and it has an extremely high demand for skilled workers. It should therefore not come as a surprise to you that almost one-third of its international students are enrolled in engineering courses. Another reason why it is a popular destination for aspiring engineers all over the world is that most of the German universities have abolished or had minimum tuition fees. 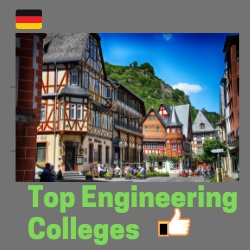 So now that you have decided to fly down to Germany to pursue engineering, let us help you out by listing down some of the best engineering colleges in the country. Around 40,000 Engineers graduate every from German Colleges but more Engineers retire every year. Hamburg and Stuttgart have highest number of Engineering jobs. A mechanical Engineer with 1-2 year experience on an average can make around 50,000 Euro/year. This is one of the best engineering colleges in the country and boasts not only of an amazing and helpful faculty but world class research centers as well. The university has research centers for cancer, food and nutrition and catalyst research. Engineering students have countless options to choose from such as aerospace, medicine, nuclear energy and so on. An applicant, trying to get into the college, is expected to open an account and fill in the key details, send along his academic transcripts and if the course is taught in German or French, he will have to show evidence that proves he is fluent in these two languages. It won’t be necessary if the course is taught in English. However, he will then have to appear for IELTS or TOEFL in which he has to score a 6.5 and 88 respectively. The winter semester applications start in April and that for the summer semester begins in November. Occupying the 47th position in the top engineering colleges of the world, TU Berlin is another University that attracts many international students who wish to study engineering. It is the second best engineering college in the country, but what makes it all the more elite is that it is a member of an elite club, known as the TU9 which has nine best German technological institutes. This allows the students at the TU to participate in student exchange programs and is a part of some of the best engineering colleges in Europe. This university gives its students exactly what they’d expect from a world class educational institute. Options to choose from a wide variety of engineering courses, a chance to participate in the student exchange program as it is a part of the elite TU9 club like the TU in Berlin and a highly qualified and experienced faculty. If you are looking forward to entering one of the best German engineering colleges, you must have Rheinisch on your list. According to the Queens World Ranking, Rheinisch is the 53rd best engineering college in the world. If you're interested, you can visit the official website of the university and make an application along with submitting the necessary documents. You might have to prove your French and English proficiency depending upon the language in which your preferred course is taught. Every student who has ever harbored the dream of becoming an engineer has certainly hoped for enrolling into this university. After all, it is one of the most prestigious engineering colleges of the world and one of the best in Germany. If you think it is just the infrastructure and stellar faculty, then you have to take a look at the different options available to you - green mobility, energy engineering - you just name it and KIT has something or the other for you. Like all other universities, aspiring students will have to visit the university’s website and fill in the details along with submission of the necessary documents and transcripts and might have to furnish proof of their German and English language skills. Another university that engineering students aspire to be a part of is the Universitat Stuttgart which currently is placed in the 107th position according to the QS world ranking. Providing the students everything that they might need - from infrastructure to innumerable engineering options - there is nothing that the university will not bring in for its students. Although it is an all round excellent university, it enjoys a stellar reputation, especially in the field of engineering. The admission procedure is very similar to the other universities that we have mentioned above. This university is one of the rare ones that combine the old world charm with the 21st-century technology so that it’s engineering students get the best of both worlds. Apart from being a popular college among international students, it is also famous as a strong research university. It ensures that its syllabus is updated and in sync with what is being taught in the best engineering colleges throughout the world. Located in Heidelberg, the college’s aim is to help create a tradition for the future. Incorporating the best infrastructure, the latest syllabus and enviable options for engineering students, this university had to be on this list. University has invested heavily and research; this university commonly features in the best engineering colleges in the country. It is well known for its scientific reputation and the highly intellectual professors and students that have made the university what it is today.